Spurred on by communications with various ex-band members and their subsequent input into the site, we have created a "news" page, allowing us to show you at a glance any news or recent site updates. If you remember the Religious As Hell EP, our very first (Merciful) Release back in the day, you might like this new t-shirt. It features the big Violet that was also used on the cover of the Natural History LP. This is the second in the series of limited t-shirts featuring classic Violets artwork. The first, Crow Baby, is sold out. So if you want one of these, please pre-order from the new Merch shop at http://www.Bilgerat.co.uk. Or if you go to the Violets Facebook page you can actually order direct from the ‘Shop’ on the page. They are available only by pre-order for roughly the next couple of weeks, then it is on to the next classic design and that’s it. Sizes from S to XXXL, Ladies S to XL and Longsleeves are available. If you want a Hoody for the cold weather let me know. I’ve been having an Autumn sort out and the new Bilgerat store also has a fair old bunch of the last of the back catalogue t-shirts up for grabs…. many of them just in the odd sizes and often the last one. So feel free to peruse the designs and see if there is one in your size. Also, I have just begun a new series of t-shirts based on my artwork over the years. Kind of retro. There will be various groovy stuff from old posters and record sleeves and stuff you never got to see! The first one is based on the CROW BABY cover. After that I will be printing them and you will have to take pot luck, and I’ll be on to the next design. Quite complimentary, Made Glorious, the album you made possible, is up for an award on terrarelicta.com. If you fancy giving us a vote please head over. Let’s see if we can give Black Sabbath a kicking! Who’d have thought it! We are doing a few gigs in April this year and thought we would let you know in case you fancied saying hello. Think Local … Cloth Cat Music Charity in Leeds, which does excellent work teaching all aspects of music (including how great it is just to get involved) in an effort to improve people’s lives. With most of their funding being stopped over the last 3 years every donation really counts…. Think Global … Friends of The Earth. And in this time of ridiculous greed, our planet certainly needs all the friends she can get. Think Ahead … Macmillan Cancer Support. A charity particularly close to our hearts, and one that most families rely on at some point in their lives. And the rather nice folks at Pledge Music are right now sending off some well-needed cheques to these organisations. And it is your money! So give yourself a pat on the back and modestly tell your friends you do a bit of work for charidee. And thank you. There are 3 more days to order the Seraphim t-shirts guaranteed in your size. Especially relevant if you fancy Ladies sizes, Kids sizes, and Hoodies. You can pick up at gigs for a major discount. The band will be starting the print run on the 10th October, to ensure shirts are ready for the first gigs on the Made Glorious tour... Hebden Bridge Trades Club on Saturday the 26th October and Preston Continental on Sunday 27th (with Flesh For Lulu, The Inca Babies and John Hyatt from The Three Johns). For anyone who missed the pledge (shame on you! ), fear not! The new Made Glorious CD is now available to buy online. Also available is a splendid new Violets t-shirt design: Seraphim. Note: please only use the 'collect' option if you are absolutely and definitely going to one of the gigs listed. Check the purchase options for CDs and for tees before purchase. If in doubt, please use the 'buy online' option and the band will ship your swag out to you ASAP. Tickets are £15 and include a free aftershow party. Saturday 26th October. We are proud to be playing the Ted Hughes Festival in Hebden Bridge, at a rather gorgeous venue, the Trades Club. Rosie will be there the day before doing some poetical stuff. Sunday 27th October. We have always claimed that John Peel changed our lives, among with many others. We did 3 Peel Sessions. So it is rather satisfying to play a tribute to him during John Peel Week, at The Continental in Preston, along with some fellow Peelite friends: Flesh For Lulu, John Hyatt from the Three Johns, and The Inca Babies. Quite a line up! Sunday 3rd November. We will be playing a nice little venue in Whitby, the Coliseum. An earlyish start, sometime after the footie and finishing early so you can head up to Nostalgia. Sunday 10th November. A visit to the lovely city of Newcastle, Trillians. First gig here since the early 80’s! Friday 22nd November. Back to Islington London for a bit of a do at the O2 Academy 2. Saturday 23rd November. Leeds. Home for a Final Purple Party at the wonderful Brudenell Social Club. We will be confirming more gigs shortly and letting you know some more of the special guests. We will also keep you updated on Pledge. Thank you all for your patience whilst we’ve been working on getting all the pledges fulfilled. Because it’s such a long time since we started this pledge and a lot of people have moved house since then, I’ve been emailing everybody to check addresses before sending stuff out. However, there are still quite a number of people who have not replied. If you have pledged on a “Special Pack”, we’d like to thank you for your continued patience. They are nearly ready now, and I’ve already emailed some of you to check addresses. Thank you to those of you have responded. If you haven’t already had an email, please look out for one over the next week or so. To those of you who pledged for Special Packs + other things. We realise it’s a bit frustrating to see other people get stuff while still waiting for yours, but don’t worry, it is coming! Also coming soon… we have pencilled in some live stuff for October/November and will be announcing dates in a few days. Can we also ask those of you ‘non special packers’ who are still waiting for stuff to check your back emails for anything from us (search Violets or MarchViolets) as a few of you have not replied to Jo’s address verification emails. Go back at least as far as April. PLEDGE UPDATE - ITS IN THE POST! Pledge Stuff is being posted out. Some of you will already have received it. Please be patient, there’s a lot to work through and we want to get it right. If the CD was being pressed in the UK (as assumed) “Made in the UK” would be legally required on the discs. But, apparently the French Pressing Plants take a dim view of the Phrase ‘Made in the UK’ when they eventually spot it. To the point of halting the process altogether and demanding artwork changes, really f**king slowly. So, back in the redeal, with Discs “Made in the EU”, your CDs should be ready to send out just after the next interminable business-unfriendly Bank Holiday. My Apologies for sounding slightly grumpy. We will be uploading the Album to Pledge Music today (Friday) they will get in touch and let you know when it will be available and how to download it. So check your emails. We are planning on having a Facebook listening party on Sunday 7th April, at 7pm till 9pm GMT, to give those of you in other time zones the chance to also participate. Still working out the best way of doing it but basically the band will be online to chat for those 2 hours, we will let you know which page/event to head to as soon as we do. Either way the info will be on all the Violets Facebook pages. We will make the album download available to you either tonight or Saturday rather than waiting till Sunday. This gives you plenty of time to download it and maybe burn it onto CD or whatever audio system you use. It also gives those of you who prefer to listen to an album a few times before commenting the chance to do just that. And naturally, the listening party isn’t compulsory, we won’t be offended if you don’t turn up. We just hope you like the album. Anyway, a massive and heartfelt thank you for your patience in waiting for this album. It has been a hell of a struggle to get here, we couldn’t have done it without your support. And through the trials and tribulations this album has grown into what is in effect a double LP. 16 tracks. And while we think it flows rather well as an album, it is a long player, so definitely have some refreshments ready on Sunday. We will be getting the CDs pressed as soon as possible, and then the mighty task of boxing stuff up and posting it out, please bear with us, we will do it as soon as we can. Hi there, still wrestling with Man Flu, it’s a cracker and likes me so much it doesn’t seem to want to go, and funnily enough the antibiotics are not proving particularly effective. Quite debilitating, and messy, and murder on the sinuses. My apologies for the further delay. Anyway, have pretty much finished I think (bit hard to judge with this flu, but hopeful). Assuming that the Mastering engineer doesn’t find anything else that needs serious tweaking, and can fit a 16 track session in this week, (and we are happy with it!) we should be on course for a listening party this month. The general consensus is definitely leaning towards a Sunday, so that is what we will aim for. On other matters, we are looking at trying to get some dates together this year, so any suggestions welcome. Could any of you lovely pledgers who have changed address and NOT told the equally lovely people at Pledge Music, please tell them your new address. Jo has been getting in touch with some of you to double check from our end before posting stuff into the void, but it would be very useful if you could keep Pledge Music up to date too…. Ta muchly. The Album is still in the mastering process, but sounding good. I’ve had to revisit some mixes and have a look at the 550hz frequency which was flagged up by the Mastering Engineer, which interestingly (or not) is a C#5. And thank you to those who have given us feedback about the listening party… We are definitely going to do it. Main suggestions for timing are mid week evening or Sunday. Please have a think about this and let us know what you reckon would be best. What time should we start on say a Wednesday? What time should we start on a Sunday? The Album lasts over 70 minutes total, so with some time allowed for general mucking about, leisurely chatting and frenzied typing of opinions I think the whole party will last about 90 minutes to a couple of hours. Am still going through this final mixing/mastering process. Stuff is sounding pretty damn good, though there are the inevitable little things to sort out, and I tend to forget that even mastering engineers do other things than just the Violets. However, as soon as the Final Masters are tweaked and approved and ready, we will want to upload them to you. An idea that we had was to have a kind of listening party where we (the band members and you) could all simultaneously listen to the new Album and chat about it online. The obvious places are Facebook and Twitter. It involves setting a day and a time… I am thinking a (UK) weekday evening might be best, the Album is over 70 minutes long, so allowing a couple of hours seems about right. But what do you think to the idea? Any suggestions? Please let us know, Ta. On another matter, I also wanted to let you know about the Launch of the Alt-Fest 2014. We are headlining one of the stages, along with Fields of The Nephilim, VNV Nation, Front 242 etc etc and more to come. I know it’s a long time away… Aug 2014, but there are some very cheap bargain tickets on offer RIGHT NOW (£55 for a ticket!) and they are going fast. So please head over to the site at www.alt-fest.com or https://www.facebook.com/AlternativeFes ... fref=tsand check it out, and get involved. Hi and hello, lovely pop-pickers. Thanking you again for your purple patience. Some of the tracks are off to be mastered. A re-record of an instrument and final tweaks to do on the last couple. If it all goes OK I think we will be sending your stuff out (rather aptly) in early March. If we can get it out sooner we will. As I said before, if it was going on Vinyl this would be a double LP. If there is enough interest we might eventually press that platter, I’d certainly love to hold some Violets Vinyl again! Here is the T-shirt design Exclusively for the Special Pack Pledgers. After lots of feedback about most of you wanting A:The Name, B:The Logo and C: Not too Big designs on t-shirts, I decided to redo the ever popular wings design, and also thought it was time to put some purple on a shirt. Ain’t it pretty? Anyway, I will be printing a few extra to cover mistakes/postal thievery etc, so, if you fancy one, after we have made sure everyone who pledged for the Special CD Pack has got one, the remainder will be available for £15 including postage on a first come first served basis… The list starts now…. email me at: postman@marchviolets.com with the size you require and if there are any left we will work down the list. I’m not making any more of this design and there will only be a few left over so get your name in quick if you want one. Firstly, can we invite you to check out Rosie’s new website. If you didn’t know Rosie is about to have her first Novel properly released next year. There is lots of fascinating stuff, about the Violets and the many other things Rosie gets up to… proving that we do have lives beyond the band! Secondly, in regard to the Album, it is still in final production and nearing completion! I have been beavering away and am finally getting there. I can only continue to apologise for the delay, it wasn’t anticipated, wanted or welcomed, and I really appreciate your patience and understanding, especially the fact that you aren’t hassling me. It means a lot. Someday I’ll write my own book about the stuff that happened during this period. Finally, we also thank those of you who have responded to Jo’s emails, saying that you are happy to wait for the whole of the stuff you have pledged for so we can post it at once. We have been posting out some of the pledge items and have more to go out this week. Just keeping you in the loop and thanking you for your patience. I am hard at it with the final mixes. Nearly there now. LAST CALL FOR THE PLEDGE! ONE DAY LEFT to Pledge and pre-order the Violets Album. Pledge closes at midnight GMT on Tuesday 18th September 2012. We will no longer be taking pledges after Tuesday the 18th September. So if there are any things you still want to pledge for, that is the deadline. We know this has been a long and convoluted process. We thank you for your patience and general loveliness. Someday we will tell the tale of all the stuff that has got in the way, it's quite a saga and still ongoing, but for the moment we once again thank you for your forbearance. Some of you will have received stuff already, other stuff is on the way, and as soon as the Album is in our hands we will be sending them out. PS. Some folks have kind of upgraded to the special pack CD, apparently you can too if you contact the lovely folk at Pledge Music. And if you have changed your address please let them know. We'd love to be able to come and do some shows for our US fans and here is the place to help make it happen. The first step is to gauge potential interest and have a specific place to share band related news and postings. Greetings from The Radiant Lodge. We decided we ought to show you a bit of what we've been up to. We also wanted to put a mix out that might get a bit of dance floor play, before we do some gigs in June. The A-side is an old school drum-machine mix of a track called Tokyo Flow. A version will be on the LP. Please excuse my rubbish Japanese. The Double-A side is a loaded ReMix of Dandelion King by Mark Gemini Thwaite, guitarist for Peter Murphy, The Mission, and much much more. And a very nice chap and good friend he is too. He has a website at http://www.markthwaite.com/ where you can check out the stuff he has been up to. This Remix is a taste of the tracks (by some of our friends) we'll be putting on the Bonus CD that comes with the Special Pack CD. We hope you like these tracks and please PLAY them to friends rather than handing them out, unless of course your friend is a DJ! In which case please do so or send them the link. In fact please feel free to chase up any DJs you think might like the White Label and ask them. Be our agents, be industrious, be obsessive! But be polite too please. Surprise us with your prolific purple love, we want our songs (that you helped bring about) to be spread far and wide. Can those of you who have pledged for either a Special Pack CD or a Signed Poster with your picture on it (which you get in the Special Pack) please send us your pictures. Jpeg format, and preferably portrait in a standard 4 high 3 across ratio. Doesn't matter too much what size, but try not to go over 4meg or so. As you may have gathered we are beginning to wind up the pledge, and in the next weeks will be ending most of the exclusives. Thank you for you patience and support. If you (or any of your friends) wish to pledge for anything (else), please do it soon. Also, for those of you who pledged for the poster with your pic on it or the Special Pack (which includes the poster), we need your pic! We will be announcing guests and giving these a bit of a push in the following weeks. If you can spread the word we would appreciate it. Valentine greetings and hugs from us! And Si is off for a bit of a jaunt with the Sisters. At the end of that, he is getting together with Tom in Athens (Georgia) to finish the recording of the LP (in the same room for once). Upon return to the UK the LP will be mixed, mastered and pressed. As soon as we have the finished article we will make it available to download and get it off to you along with any other stuff you pledged for. We will also be sending out any other pledges during this period and doing a bit of video stuff, including those of you who kindly pledged to be in them. And please let us know which t-shirt design you want. We are very aware that this LP really has turned into the Violets difficult first Album. Lots of unforeseen crises and that's-life-things cropped up and got in the way. We could give you the list but it's a bit boring and we'd rather give you our thanks for being patient. It is rather incredible to have support from people like you, and a little humbling. So hang in there, we have a clutch of (we think) great songs that will soon be unleashed upon a largely complacent and unsuspecting world, and that is down to your good selves! Don't forget to come and see us live this Summer if you can, we don't get out much and need the company. There's a new video available for Dandelion King available over on the Pledge site. It's been assembled by Craig Duncan using live footage from the 2010 London Academy gig. Maybe you are in it? The video is an exclusive update for pledgers only, so you'll need to sign in or pledge to access it. We understand the following exhibition, which is currently on in Leeds, has several items of interest belonging to The March Violets, The Sisters of Mercy and Salvation, in addition to lots more bits and bobs from other Leeds bands. Go see it while you can! Exhibition opening times: Friday 12th August 2011 to Saturday 27th August 2011. 9am to 5pm every day except Sundays. Fundraiser gig Friday 19th August at the Brudenell Social Club, all Leeds bands including covers of Leeds songs. Featuring members of Pale Saints, Red Lorry Yellow Lorry, Three Johns and other familiar faces from the Leeds scene. This exhibition celebrates the music culture of Leeds through a unique collection of memorabilia, records, programmes, posters, t-shirts, instruments, awards and artworks that tell some of the stories of the Leeds music scene over the last sixty years. It's been put together in true DIY spirit that fans of the Leeds scene will recognise, and aims to make some noise about the great music that is made and played in Leeds. We have been overwhelmed at the generosity of fans, promoters and musicians that have sent their memorabilia from the far flung corners of the globe - there are some real treasures here. Come and have a look and share your memories of great Leeds bands, gigs and venues. This is a once in a lifetime opportunity to see this collection of stuff - don't miss it! Just wanted to say thank you to those of you who came along to some of the dates we played last month. It was lovely to put faces to some of the names. Now it is back to working on the LP, and creating a classic! The new "Love Will Kill You" EP is now available to buy via our good friends at MusicNonStop.co.uk for the princely sum of five and half english pounds. Huge thanks to Andrew Collins! Here's the artwork for the new EP and T-shirt. "Rather than keep the aftershow at the Cockpit as we had originally planned we have decided to team up with the lovely people at Flock, one of Leeds finer and darker nights, to enable us to bring you a more private and groovy party with much better music, and more importantly with pub prices. So, after the show, go diagonally across the square and get on a number 6 bus from J3 stand at the bus depot at Albion street, which will drop you directly outside The Library Pub just after the University. Easy! Or walk up to Albion Street and get a 1, 28 or 95, they go every 5 minutes. Someone will show you the way if you don't know, make a new friend!" The gig itself remains at the Cockpit, doors at 7pm sharp. Get there early to make sure you see the first ever show by "The Partly Faithful" featuring Ed Banshee (ex of Screaming Banshee Aircrew) on vocals. History in the making! Followed of course by the fantastic Mr Simon Hinkler, and then the MVs themselves. See you at the gig - it's going to be a good one! Tickets available from http://www.musicnonstop.co.uk/themarchviolets.htm, Jumbo Records and Crash Records in Leeds, and probably the Cockpit. Early Start, Bands off by 10.15, then party or home... your choice. In contrast to the rather suave "Dandelion King", "A Little Punk Thing" is a somewhat rude and raucous comment on the state of things now and then. We're not just offering the CD or a download. There will be stuff that goes along with it, stuff that makes it more special than if it was picked up on fileshare, or streamed online. And don't forget, as a pledger you automatically get the download of the Album anyway, and you'll know that the money is going to contribute to us being able to continue making music. We'll also be donating a percentage of the Pledge to three charities. Think Global: Friends of The Earth, for we surely are. Think Local: Cloth Cat, Leeds Music Charity, helping people improve their lives through music. And finally, think ahead: the Macmillan Cancer Trust, from a survivor and her friends. Thanks for reading and we'll see you very soon. Play Loud, Pledge Purple! Yep, we have arranged with a video company to do an HD video of this little shindig, so if you want to be in it... get a ticket, and actually, if you have already said you are coming and not bought yours yet, it's about time you did! If you remember we had a weird little "gigeo" last year where we filmed a video for the track "Dandelion King" and then did a gig, in a large old church. Those who actually bravely turned up in the Scary November Snow will remember that the gig involved a bit of Psydwr, blowing up the PA, and accompanying Si to the bar while it was fixed. In other words, a memorable and typically Violets style happening. We gave the track to pledgers a while ago, and have finally got the video that goes with it. So here it is. We hope you enjoy it. Especially if you are one of the "ghosts" in it, apologies to those who didn't make it to the finished cut, we'll try and get some out-takes up to show you in your full plumage! but you can also see it at the excellent http://www.AshTV.co.uk who made it. SO.. FREE STUFF.. ANYONE FANCY A VIDEO? The Violets' Si Denbigh is now writing for new alt.goth online magazine The Alternative Community. You can read Si's "intro" piece by following the link below, where he remembers what it was to be a punk (back when the identity wasn't being sold off-the-peg, at least not by anyone other than Malcolm McClaren), briefly wonders where all the real rebels have gone, and finally concludes he could just be in the right place to connect with kindred freaks once more. Looking forward to reading more of his writings/ramblings in future. The first of the new batch of songs is now available for download for those of you who pledged towards the album. We're pleased to announce it is a groover. Yes indeed. We are releasing a 5 track EP called 'Love Will Kill You' in June. We will be releasing the tracks to March Violets Pledgers for free over the next few weeks, and in fact giving a physical copy to them later on. And we will be releasing the March Violets' first proper LP later this year. The really good news is that your £15 ticket for one of the UK warm-up gigs in Leeds, Norwich or Glasgow gets you a free Violets T-Shirt in your size, a badge and entry to an aftershow party. Those £15 tickets that come with the free goodies, will be on sale from April 13th on a first come first served basis, available via http://www.musicnonstop.co.uk/ from 13.00hrs. This years line-up offers some amazing treats including the legends of the batcave, SPECIMEN, kings of electro, UTAH SAINTS, the masters of rockabilly, VINCE RAY & THE BONESHAKERS as well as special guests UK DECAY. Apologies for the lack of contact, have been incredibly busy with song writing and other bits of life that kind of get in the way. Anyway, we now have some rather excellent new songs that are being prodded into shape and given a good going over. "Eom Draca Albion" is an epic with Old English lyrics, that starts at 60BPM and builds.... a lot. The Sea Shanty, provisionally entitled "Barbary Coast" has become a bit of a stomper. And we have finally got "We Are All Gods" down and it is rather hypnotic and features some trippy violin from Jo Violet. The Title track to the Album (soon to be revealed) is classic Violets and should be a big one. We have a smorgasboard of Punky stuff, with "Ape-x" and another as yet unnamed ditty and some twisteddiscodancefloor stuff with "Discoboy Must Die" among others. I'm just about to do a little birthday jaunt with the Sisters, and will try and use my downtime between partying to get these t-shirt designs finished. And some of you may have noticed we have confirmed to play at WGT [Wave-Gotik-Treffen - Leipzig Germany]. We are headlining the Felsenkeller on the Friday. Should be fun! Huge Purple Thanks and Many of them from The March Violets to All who pledged!!! We have indeed hit our target and can now get on with the hearty endeavour of constructing an exciting new album. And we must really thank you all for this opportunity to do it our way. You have proved that the independent spirit can survive. Hopefully the pledging will continue, allowing us to make this album even better, with videos, promotion and above all, some gigs. And don't forget, as things progress, we will be posting exclusive demos and stuff for pledgers. WE ARE 94% THERE! HOORAH!! Thanks to all your help, we are within touching distance of our target! Please keep on persuading your friends to Pledge Purple. The pledge is now up to 89%, and with just 17 days left we're asking everyone to get behind the final push! And Thanks for getting us up to 80% of the target, it is fantastic. We just need another push, so please ask your friends to join you and pledge… If each of you persuades just one person to pledge we will go well over the target…Pick one friend and get personal! I must apologise for not having got the t-shirt designs up, and thank you for taking them on faith… they will be good. But because I have been so slack, I think we will be very flexible about the designs, and allow anyone who has pledged for one to swap, even after we hit the target. So I will post a selection of designs at some point and you can decide exactly which one(s) you want. I always think it’s the antici…………….pation that is the fun. Thanks again. Here is how this works. We have set a target. We will be releasing the album on our own label and this is the money we feel we need in order to do it justice. It will go on recording and mastering the album so that it sounds as good as it can, and then marketing so that it goes as far as it can. It will also help to get us back out onto the road so that we can play it to you around the world. Take a look at the list on the right hand side of the screen and decide how you would like to get involved with the project and make some pledges. No money exchanges hands until our target is reached. Simple. Those of you who pledge will basically be investing in the album, so to make sure you know what you’ve paid for we’ll post ‘pledgers-only’ updates and videos in the ‘Pledgers Only Page’ – our own little site on Pledge – you’ll be able to keep up to date with what’s going on. Demos, rough mixes, videos, blogs and anything else we think you’ll like. We want to do this in a collaborative fashion and really bring you in on the project in a way that just wasn’t possible in the 80’s. We'd love people to dress up for this: Elvis, Spacemen, Cyber Vampyres, Edwardian, Goth etc. The Court of the dandelion King stretches to the 22nd century!! There will be a bar (maybe even PSYDWR!) and there's a curry house round the corner. Lots and lots and lots of photos from the O2 gig appearing on Facebook. You may need to be logged in to Facebook to view them, depending on each photographer's privacy settings. Thanks to everyone who took those. For those that couldn't make it, you missed a treat. Just reminding those of you who are coming to this Purple Event that we are on stage very early. So be there early to avoid the Crush... Tickets are still available, though on the door you will have to pay cash. FOR THOSE WHO HAVE NOT RECEIVED THEIR TICKETS, YOU SHOULD BRING PRINTOUTS OF ANY DOCUMENTS AND THE CARD YOU USED TO PAY TO THE BOXOFFICE. And make sure you keep a ticket stub to use to get you into the Slimelight for free! We have talked about it for a while and have finally decided to record a new Album, and we need your help. We will be working with Pledge Music to raise the finances we need to record and launch this new LP next year. This way is as close as we can find to the independent way we did things back in the 80s, only this time you get to be involved. There will be lots of interesting things that you can Pledge for, this involves a promise to pay for some stuff when enough pledges have been made to reach our target. The most basic pledge is for the download of the LP, and everyone who makes ANY pledge will get a download. Pledges include a nicely twisted range of stuff, from limited edition T-shirts and signed and framed original 80s posters to Cider with Rosie and even the opportunity to be on the Album! If you pledge you will also have unique access to demos of the new songs and videos and the chance to really get involved. We will also be bringing you a new Violets site at www.radiantlodge.com, the sprawling stately home of the March Violets. You will be able to become a Lodge Member and explore the weird environs of the Lodge. The Radiant Lodge is going to be the place to be for the next few days... Violet Newsflashes and other Nonsense, so dial it in and stay tuned... Or have a chat with Rosie in Whitby, seek that Temptress out, she doesn't Bite.... oh, errm. Back from the dead, the March Violets have reformed for a rare event. Saturday 13th November at the 02 Islington Academy London, and then straight over the road to the Slimelight for a 3 floor purple Aftershow Party that goes on till 7.30am, and all for £15! Featuring the original explosive line-up of the Violets, performing a selection of their classic tracks that are still rocking the darker dancefloors and made them a top ten Indie band back in the 80s (when Indie meant Independent). Expect Snakedance, Walk into the Sun, Crow Baby and some new material from the Brand New Album they are currently creating. Support at the Academy will be Ulterior, described as Primal Scream meets the Stooges with a drum-machine. And for The Aftershow Party, Sigue Sigue Sputnik will be getting their Love missile out! Faderhead will be catering to the more electroid. James Ray's Gangwar have agreed to reform and lurk in the darkness and the latest gothic new sensation from Leeds, Black Moth, will be dancing round the lights. More Aural Pleasure will be provided by DJs Danny IV from Ladytron, Ashley Casselle (Global Underground/Wall of Sound/Paper Recordings), Dead Matty, Heartlander Quiff Boy and Grandmaster of the dark turntables Martin Oldgoth. To lubricate the party spirit will be the launch of a brand new drink, PSYDWR, somewhat mental Welsh Cider with Wormwood (yep, the Absynthe stuff). The first pressing of the drink "Grooving in Green" will be released at the Aftershow Party in the Slimelight. This has to be a first. There's another Violets interview over on the Return To The East blog, this time with Rosie Garland. As before, a great interview with some fascinating tidbits of info, gossip and Violets trivia. There's a new interview with Simon D posted over on the Return To The East blog. It's a very entertaining read and contains some real insights into the Violets' origins, their original demise, and their plans for the future. For those of you wondering what to do after the show in the Academy finishes. Fear not. Part 2 of the night is just around the corner, literally. All ticket holders are graciously invited to step into the Slimelight for a continuation of the Purpleness. There will be more guest artists performing live: Faderhead is already confirmed for the more Electroid amongst us, plus gothique karaoke horror, Vjay nonsense and drinkies. There will not be a raffle. The O2 show starts at 6pm and finishes at 10pm. Free entry to the Slimelight for ticketed folks begins at 10pm and ends at midnight. The Slimelight closes at 7.30am, perfect time to stagger back to the station for the ride home. Major Thankyous and Respect to the Lovely Slimelight Crew for this. Tickets cost £15.00 and are on sale now from the venue or via Ticketweb. So: We have confirmed a place and time for the next Violet Event. London, Islington Academy, Saturday 13th November 2010. We haven't decided which of our friends will be playing with us yet, but hopefully this one will be as much fun as the last reunion. We will do our best to make it special, hope you can make it. Stay tuned for more details, including news of a new album. We've added a new section to the Discography detailing all known Radio Sessions the Violets' recorded. The US film director and writer, John Hughes, who created some of the most famous comedies of the 1980s and 1990s, has died at the age of 59. The director died after a heart attack in New York, his spokeswoman said. John Hughes, Jr. (February 18, 1950 – August 6, 2009) was an American film director, producer and writer. He made some of the most successful comedy films of the 1980s and 1990s, including National Lampoon's Vacation; Ferris Bueller's Day Off; Weird Science; The Breakfast Club; Some Kind of Wonderful; Sixteen Candles; Pretty in Pink; Planes, Trains and Automobiles; Uncle Buck; Home Alone and its sequel Home Alone 2: Lost in New York. The March Violets contributed 2 songs to the soundtrack for Some Kind of Wonderful and also had a cameo role in the film. Hughes' films captured the zeitgeist of a whole generation and he has a place in the heart of many a misunderstood 80s teenager. sky tv's "sky player" currently has the john hughes film some kind of wonderful available for download. We will be stopping selling E-tickets and pre-ordered CDs at midnight tonight. Bit short notice I know but it's taking up a lot of time and we're pretty busy at the mo. No need to panic if you haven't got a ticket yet. Tickets will continue to be on sale at the usual outlets and presumably on the door at the gig. CDs will be available in limited numbers at the merch stall, but when they are gone they are gone. At about midnight the links to the e-ticket site will stop being valid. Front and back scans of a postcard "flyer" for the 2007 Homecoming gig have been uploaded to the Image Gallery. The back of the flyer has a promo for the "new release" (ltd to 1000). The front page & news sections have now been merged into a blog-style front page, with the most recent articles appearing on the homepage while the older news drops back to the News Archive, where you can view the complete history of news posts. That should hopefully make it easier to follow all the breaking March Violets info that seems to be around these days! I've also upgraded the forum to the latest revision of the software, which is phpBB 2.0.22. There are no huge changes to the site content as such, but I've added large versions of the 7" single sleeves in the Discography section (Hint: click on the sleeve thumbnails) and I've made some subtle tweaks to overall the design & layout that I've been meaning to do for ages, which should make the site generally easier on the eye. Due to the high demand on our server could you please right click the link above and choose 'save target as' in order to download the file onto your computer. If you wish to distribute the track via a link, please only link to your downloaded file. Thank you! ...with some pretty special prizes! these are real ones, signed by the bands playing at the Show, and any other famous friends who might be at the gig. You can stick them on your wall, or even go and start your own band.... now there's a thought! 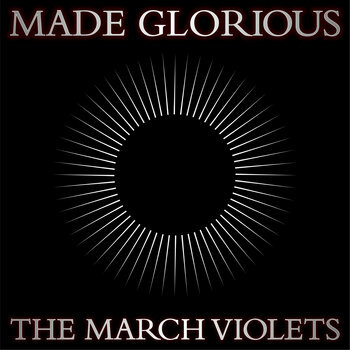 - The first record by the March Violets.. Religious as Hell 7" EP on Merciful Release. I've added details of the reunion gig and the official 2007 t-shirt to the site's homepage. Si Denbigh, Rosie Garland and Tom Ashton are preparing a choice feast of classics and new material in order to serve it to you at Leeds Metropolitan University Union on Saturday the 8th of December. There will be an exclusive cd of new material...only available to ticket buyers, some special guests and some special happenings and also an aftershow party licensed until 3am. We want to celebrate this and we want to do it with all our fans both old and new. Oh, and did we mention that the resulting mess will be filmed for possible future release? We just did. Tickets will be on sale within the next 24 hours and we will send out an event invite to all our friends here, so keep an eye on your inbox. You will be able to buy tickets directly from this page...which will probably be the cheapest option and also from Leeds Met on their website and other local outlets tba. Just one more thing for now...if you are female with long black hair and feeling particularly drunk/happy/silly/etc and happen to have a mobile phone with video capabilities [or even, gasp, a video camera] could you please film yourself headbanging to our new track, Long Black Hair. Just download the 45 second snippet of the track on our myspace player, film yourself or get a friend to and send us the results using the link below...the video will be shown at the gig when the band performs said track...mmmm...could be interesting. On Saturday December 8th 2007 The March Violets play their first gig since the 1980s, featuring the original line-up of Si Denbigh, Rosie Garland and Tom Ashton. We deliberately went for a Saturday to make it better for those of you who work or who are thinking of travelling. … see… we still love you! There are 1000 tickets, no more. They will be initially be available via the Myspace page http://www.myspace.com/officialmarchviolets with other outlets to follow. 2) Rumours of a reunion gig surface.. The lineup would appear to be Simon D, Tom & Rosie, plus an as-yet unnamed bass player. 4) A snippet of a new song appears on their MySpace page: Long Black Hair along with an appeal to send in clips of yourself shaking your hair to their song! 5) That's about all... so far! More info as and when it becomes available. They are all at the bottom of the page, and begin with "violets..."
"New site is uploaded. Added final mix of the Western Lullaby instrumental plus some mp3 previews that may be of interest to you March Violets fans out there. Also bunged in some of the press that the MULTIVERSE has received recently." See the Image Gallery / Other for more details. Just a quick post to let you know that I've made a few changes ot the news page - http://www.marchviolets.co.uk/news.php - to tie it in more with the forum. Also, the URL of the RSS feed has changed to http://www.marchviolets.co.uk/rss.php - please update your browsers and feed readers accordingly. Digging through some old emails last night we've realised there were quite a few photos that haven't been uploaded to the gallery yet. They're mainly autographed memorabilia, and we'll get onto it sometime next week. Apologies to anyone who has sent stuff in the last couple of months - it hasn't really disappeared into a black hole! INTERVIEW WITH TOM ASHTON IN THE LATEST EDITION OF "THE MICK"
Rosie, Loz and myself have been talking about the possibility of a reunion. We are all very much up for it. It would have to be the original line up with Simon though. Does anyone know where he is? Oh, what a catharsis if we could get out there and pick up where we left off in 1984... something to see I would think! "Anyone wants to drop me a line either fans or members of the Violets, I'd love to hear from you as I do have a question. What or who is behind the design I have on my leg?! Was it penned by someone in the band? Is there a "meaning" to the symbol? Any information you could give me would be great to know." AMENDED DISCOGRAPHY INFORMATION FOR "TURN TO THE SKY"
Andy has updated us on his whereabouts and offered to send some of his old photos for the site. See Where Are They Now? Laurence has updated us on his whereabouts and offered to provide us with archive material for the site. See Where Are They Now? Rosie has updated us on her whereabouts and offered to provide us with archive material for the site. See Where Are They Now? Tom has updated us on his whereabouts and offered to provide us with archive material for the site. See Where Are They Now? Tom's niece contacts us and offers to let Tom know about the site. See Where Are They Now?